Upright: Revisiting the past, childhood memories, innocence, joy. Reversed: Living in the past, forgiveness, lacking playfulness. In the background, an older man walks away in the distance, as if to say you no longer need to worry about adult issues; just enjoy the moment of being young, innocent and free again. The children also appear to be standing in the courtyard of a large home, symbolising comfort, safety and security. In the foreground stand four more cups filled with flowers, and a fifth cup sits on a pedestal behind the boy. The Six of Cups is a card that takes you back to the happy memories from your past, whether as a child, teenager or young adult. 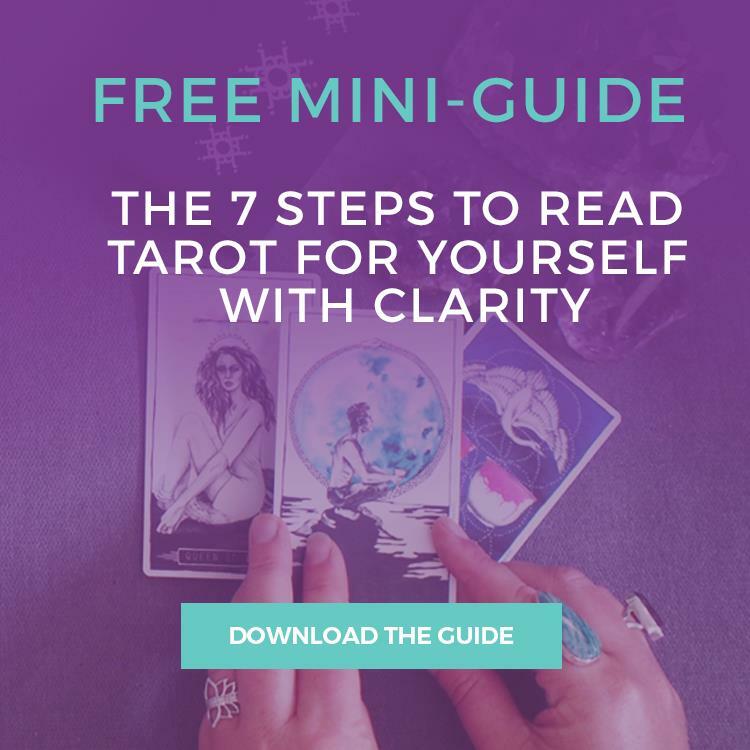 You may simply be revisiting those memories in your mind, or you may travel back to your childhood home or reconnect with your childhood friends. You could go to a high school reunion or reconnect with an old buddy. A teenage sweetheart or past lover may turn up again. These connections bring you a sense of joy and happiness as you reminisce over all the fun times you had together. Take this occasion to explore whether you still have a lot in common and if you wish to continue the relationship now. The Six of Cups often shows an increased level of harmony and cooperation in your relationships. You are ready to give and receive, without expectation. You are also willing to give each other the benefit of the doubt, having moved on from the challenging emotions of the Five of Cups. It’s time to turn over a new leaf and start afresh from a more positive place. 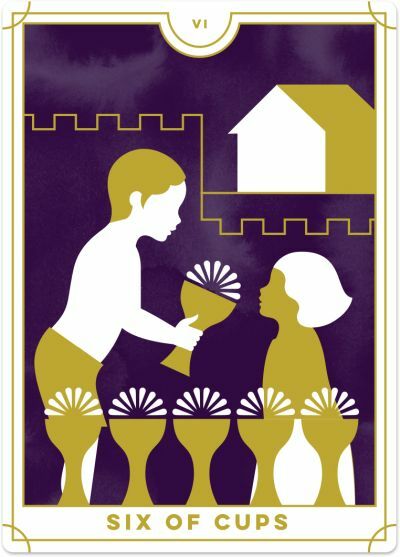 The Six of Cups invites you to get in touch with your inner child and experience the fun, freedom and innocence that comes with being a young child again. You might like to sit down with an adult colouring book, dance like no-one is watching you, play your favourite childhood games or spend more time around (happy) children. When you give yourself permission to be playful, spontaneous, and creative, you connect more with your authentic self and your intuition. The Six of Cups can also refer to children in your life. It can suggest a pregnancy (perhaps twins), a birth and siblings who play nicely together. It may also be a sign that you are about to spend more time with young children, playing, laughing and learning together. Children are often here to teach you something about yourself and can serve as great advisors. Kids also set good examples for how to stay present, open-minded and curious. They see the world as a magical place and their hearts are open to the myriad of pleasures available to them. When the reversed Six of Cups appears in a reading, ask whether you're clinging to the past and losing touch with the present. Reflection and nostalgia may bring up positive or negative feelings, but either way, when you find yourself wishing for ‘how things used to be’ and not living in the present, you miss out on the opportunities right in front of you. It's OK to indulge a little in reminiscing about the past, as long as you understand that true and lasting change can only happen in the present moment. See the Six of Cups as an opportunity to make peace with the past so you can focus on the now. Learn from your mistakes, forgive others and yourself, and acknowledge that life is continually evolving. Let go of the past and bring your attention firmly into the present. The reversed Six of Cups may also be a sign you have lost touch with your inner child and life has become boring, repetitive, and ‘stale’. You might be closed off from new opportunities and gifts from the Universe, simply because you are taking on too much of the responsibility and heaviness that come with 'adulting'. Open yourself to a curious mind and to have fun as though you were a child again. If you find yourself saying, “Oh but I don’t have time!” then make time!! Play! Have some time out. Go jump in puddles or build sand castles. The Six of Cups reversed might be a sign that you are taking a private walk down memory lane. Perhaps you are thinking about an ex, or you’ve even started seeing each other again, but you want to keep this information quiet. You may be reluctant to let others know that you are revisiting these old memories or relationships, in fear that they may judge you.